CSX reported a considerable improvement in its second quarter earnings driven by top line growth and the impact of the company’s productivity improvement initiatives. Higher fuel surcharge revenue (as a result of higher fuel prices) and core pricing gains amid firming demand conditions drove the growth in the company’s revenue, in addition to shipment growth as a result of higher coal shipments. 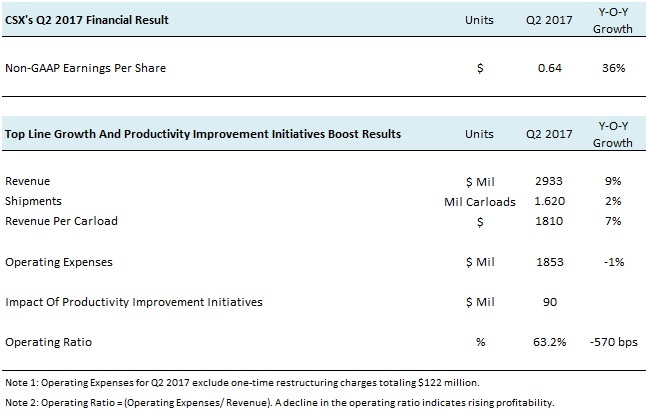 While favorable top line growth helped prop up CSX’s results, the company executed another successful quarter of productivity improvements, driven by the implementation of the new CEO’s ‘Precision Scheduled Railroading’ initiative. The company improved on-time arrivals from 69% in Q2 2016 to 79% in Q2 2017, driven by the new initiatives. In addition, the company was able to rationalize its active locomotive fleet, lower its labor headcount, thereby improving asset utilization and controlling expenses. Going forward, the company’s ongoing ‘Precision Scheduled Railroading’ initiative is expected to yield more productivity savings over the rest of this year. Moreover, steady economic growth and the federal government’s business friendly policy stance is expected to drive rail shipments growth over the rest of the year, particularly with respect to coal, which has seen a significant revival in fortunes this year. Thus, revenue growth and productivity savings are expected to drive improvements in the company’s results in the coming quarters.